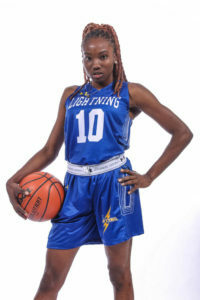 On the day she was planning to return to Tortola after completing her freshman year, Joy Victor, the territory’s first woman to play collegiate basketball for the University of the Virgin Islands, found herself on a journey that changed her life and she ended up in Calgary, Canada, instead of relaxing at home during the summer. As the season had ended, Victor got a call from UVI coach Reggie Carrick like everyone else individually, where he asked how she thought the season went after they lost 5 of 13 players following Hurricane Irma. At the end of the meeting, Victor recalled being told she won’t have a scholarship at UVI anymore. With a $150 application fee, Victor decided to apply to St. Mary’s College to have a second option after speaking with the UVI track coach and thought that was her best option since she had already paid the fee. Victor booked a flight and went straight from Trinidad and Tobago to Canada, leaving her belongings in Tortola. Through the ordeal, she made the team and though she played a year with UVI, that doesn’t count and she has her four years of eligibility with St. Mary’s, which won their first ACAC championship in 2017. Victor not only had to adjust to the team, but the weather, a new city, a new environment and being on her own fending for herself in an unfamiliar place, where she didn’t know how to get around.